The War Memorial Center, along with Milwaukee County Parks, Milwaukee Rotary, and Milwaukee Art Museum have jointly proposed to develop a comprehensive plan for a stretch of county land between Lincoln Memorial Drive and the lake. Despite its high visibility and public use, this area currently has no such plan, and runoff from the parking lot north of the War Memorial Center flows directly into the lake. The Fund for Lake Michigan is therefore supporting this joint effort to develop a plan that will improve habitat and stormwater retention. 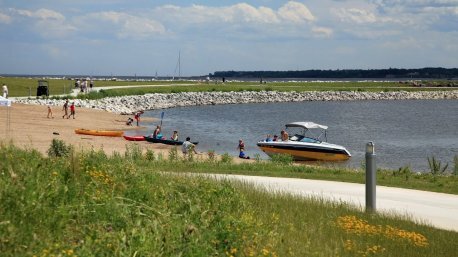 Among its recommendations, the plan will include specifics about incorporating green infrastructure into the parking lot, as well as implementing stormwater best management practices along the shoreline.